The hand is made up of numerous structures that control its various functions. 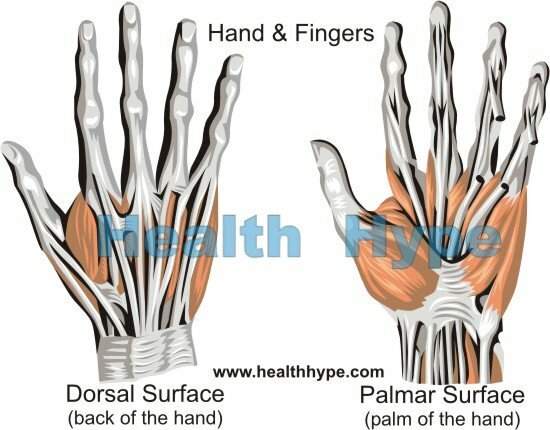 Pain in any part, either the palm or back of the hand, can occur due to conditions affecting any of these structures and can lead to impairment of normal hand functions. Commonly, hand pain occurs due to injury, inflammation, infection, overuse, problems related to normal aging, or certain medical conditions. the dorsal surface which is the back of the hand. There are numerous joints that make up the hand which allow it a wide range of movement and flexibility, thus making it possible for it to perform various functions. Wrist joint connects the hand to the forearm. Carpometacarpal joints where some of the carpal bones (wrist bones) articulate with the long metacarpal bones (hand bones). Metacarpophalangeal joints where the five metacarpals (hand bones) connects with the phalanges (thumb and finger bones). Interphalangeal joints where the two phalanges (finger bones) in the thumb and three phalanges in the other fingers connect. Ligaments are strong bands of tissues that hold bones together. The collateral ligaments on either side of the bones of the fingers and thumb prevent sideways bending at each joint. Muscles in the hand control the fingers. This includes the thenar and hypothenar, interossei and lumbrical muscles. Tendons join muscle to bones and contraction of the muscles result in movement of that area. The tendons that move the hand start from the muscles which are located in the forearm. Some of the muscles controlling the fingers are also located in the forearm and its tendons run across the hand. The radial, ulnar, and median nerves pass into the hand from the forearm and supply specific parts of the hand. Injury or irritation of these nerves can lead to pain in the hand, fingers, and thumb. The nerve that is most commonly affected is the median nerve as it passes through the carpal tunnel at the wrist giving rise to the condition known as carpal tunnel syndrome where there is pain along the distribution of the median nerve in the hand. Signs of injury, such as burn or laceration. Discoloration, such as red, blue, or pale hands. Abnormal sensations, such as hot or cold. Signs of associated inflammation, such as redness and swelling. Difficulty in performing hand movements. Fine movements of the hand may be affected, such as writing. Decreased strength in the hands or arms. Difficulty in forming a grip or decreased grip strength. Flu-like symptoms such as fever and sore throat. Systemic disease, such as rheumatoid arthritis or diabetes. Injury to any of the structures of the hand, such as a tendon, ligament, muscle, bone, skin, nerve, or blood vessel. Obvious signs of injury are likely to be present along with hand pain. There may be crushing injury, laceration, fracture, or presence of a foreign body. 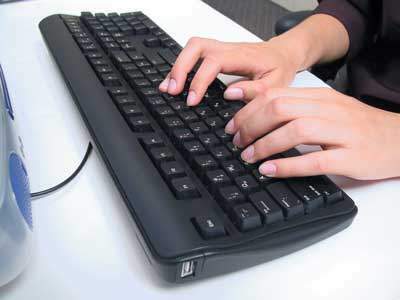 Overuse or repetitive hand movements, as in typing on a computer keyboard, repetitive wringing at the wrist, sports such as handball, or sewing can lead to problems such as carpal tunnel syndrome, tendinosis, De Quervain’s disease, or writer’s cramp. Also refer to texting thumb. Tendinitis which is inflammation and swelling of the tendon or tendon sheath. Surgery to the hand may result in post-operative pain or at times there is unintentional damage to the hand structures. Carpal tunnel syndrome, causing hand pain, may also occur due to other causes such as diabetes, obesity, rheumatoid arthritis, hypothyroidism, and pregnancy. The symptoms of carpal tunnel syndrome occur due to compression of the median nerve in the carpal tunnel at the wrist. Cervical spondylosis where the discs between the spinal bones in the neck are worn out. This may cause the nerve roots to be compressed (pinched nerve). Peripheral neuropathy where the nerves of the hand are inflamed, damaged or diseased as may be seen with a pinched nerve, nerve injury, diabetes and other conditions. 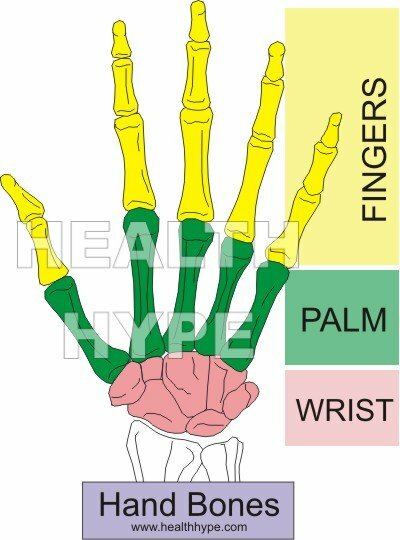 There are numerous joints between the bones in the wrist, hand and fingers. It can be affected by several different types of joint problems which may then give rise to hand pain. Paronychia – around the finger nail. Felon – infection of the pulp space of the fingertip. Dupuytren’s contracture – abnormal thickening of the fascia or the tissue beneath the skin of the palm. Myocardial infarction (heart attack) may present with arm pain that can extend to the hand. Raynaud’s phenomenon – extreme cold or emotional stress precipitate this phenomenon in certain individuals, causing spasm and constriction of the blood vessels of the fingers and toes, resulting in pallor, tingling, numbness, and pain in the hand. 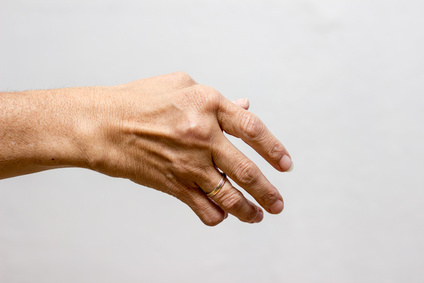 The diagnosis of hand pain may be obvious in certain situations such as in case of injury. In other cases, diagnosis may be facilitated on eliciting a proper history and a thorough physical examination. Active and passive range of motion may need to be assessed. Blood tests, including complete blood count (CBC), ESR, antistreptolysin-O-titer, rheumatoid factor, and serum uric acid level. The treatment of hand pain will depend upon the underlying cause. General measures such as wound care and resting the hand. Medication for pain relief, such as nonsteroidal anti-inflammatory drugs (NSAIDs). Last updated on October 9, 2018.